Artists, galleries and collectors often have artworks that been transported or rolled up in tubes and need to be re-stretched ready for framing, exhibition or display. Re-stretching painted canvases requires skill, patience and careful measurement. 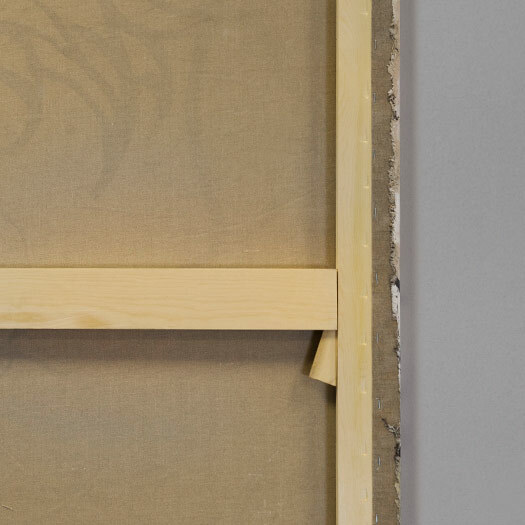 We check the amount of turnover available on the canvas, the condition of the paint layer, the square of the image and any bowing of sides caused by previous, inadequate stretchers. We then suit stretcher or strainer structure and type to the work and select the optimum stretcher bar weight. We are also happy to stretch and frame previously unstretched canvases and digitally printed canvases. We work with painting and artwork conservators and restorers should your canvas need specialist attention, lining or cleaning. We are always happy to advise and provide quotes on work needed to bring your artwork back into a stable and presentable condition.